I have imported a form from Adobe FormsCentral. All fields as they should appear on the form have imported. When trying to create criteria for when to show a particular field, and reference another field, there are two fields that do not appear in the 'visible when' Basic Editor dialogue box. By trying to build a reference to one of the 'missing' fields in the Advanced Editor, an error is displayed 'no field exists'. If I try to add a new field, that also does not appear in the Basic Editor dialogue box. Advice please as to why two fields are not visible, and why I cannot create a new field that is visible. IF a question "What was the reason for changing lenses? 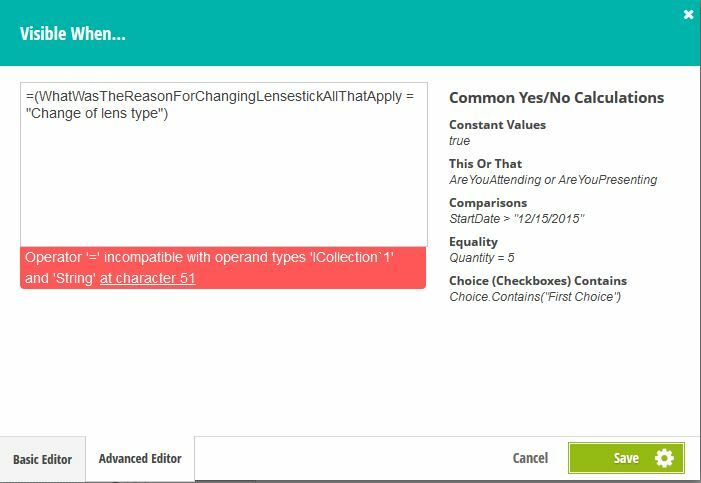 (tick all that apply)" is answered with "Change of lens type" THEN the question "What was the reason for changing lens type? (tick all that apply)" should be visible. From the first screenshot it can be seen that Cognito does not recognise the field, yet the second screenshot does recognise the field but the conditional logic gives an error. In fact it will not even save - the cog wheel just keeps turning. I have managed to sort this out after searching other posts. 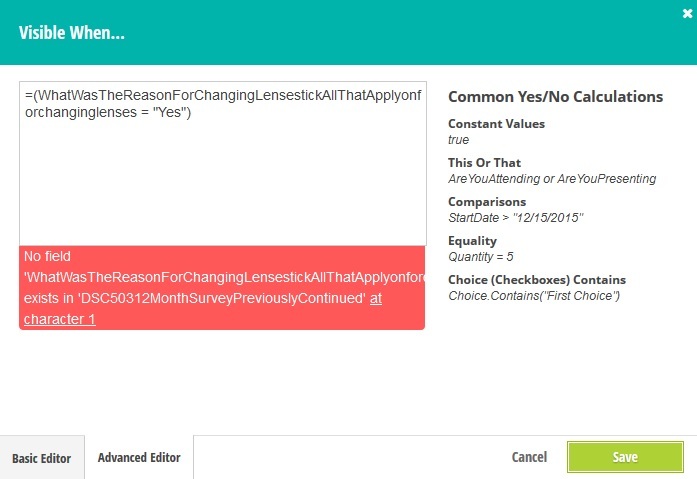 Choice fields that allow users to select multiple values (checkboxes) do not appear in the basic editor for conditional logic. However, you should be able to enter calculations in the advanced editor referencing these fields. Please update your question to include a screenshot of the form you are trying to build and what you are trying to accomplish and I will update my answer to provide an example of how to write conditional logic with Choice - Checkboxes fields that is specific to your needs. How can I have conditional settings available when I use choice fields in check boxes? Is conditional logic limited to items in a section in Cognito Forms?